WASHINGTON — NASA’s InSight spacecraft is on track for a landing on Mars Nov. 26 on a mission to study the planet’s interior. Scientists and project managers, speaking at a pair of briefings Nov. 21 at NASA’s Jet Propulsion Laboratory, said there are no issues with the spacecraft, which is on course for a landing at approximately 2:54 p.m. Eastern Nov. 26 in the Elysium Planitia region of Mars just north of the planet’s equator. Rob Grover, the entry, descent and landing (EDL) lead for the mission, said that since the latest trajectory correction maneuver by the spacecraft Nov. 18, the spacecraft appears to be within about seven kilometers of the planned landing site. “We’re very close right now,” he said. “We may not need our last course correction maneuver.” He said the project will decide by the end of the day Nov. 23 whether that maneuver, which would take place Nov. 25, is needed. Conditions at the landing site appear to be ideal for landing, he noted. The global dust storm that swept across the planet in June, shutting off contact with the Opportunity Mars rover, has long since faded, and there’s been no signs of storms in the vicinity of the landing site. “We’re expecting a very plain day on Mars for the landing, and we’re very happy about that,” he said. The Lockheed Martin-built spacecraft will slow down from 5.5 kilometers per second at the beginning of the EDL phase, about 125 kilometers high, to zero in 6.5 minutes, using a combination of a heat shield, parachute and thrusters. The spacecraft will deploy its solar arrays starting 16 minutes after landing, a delay intended to allow dust kicked up by the landing to settle, with the deployment itself taking an additional 16 minutes. NASA hopes to get realtime telemetry of the landing from a pair of cubesats, called Mars Cube One (MarCO), that launched as secondary payloads with InSight in May and will fly past Mars during the landing. The MarCO cubesats, intended primarily as technology demonstrations, will be able to relay the telemetry from InSight and broadcast it back to Earth. In addition, InSight itself will broadcast a “beep” about seven minutes after landing, a signal indicating that it is on the surface. NASA’s Mars Reconnaissance Orbiter will be able to provide data with a brief delay, including a first image from the surface taken by the lander. Confirmation that the lander’s solar panels are deployed, though, won’t come until about five and a half hours after landing, after an overhead pass from the Mars Odyssey orbiter. 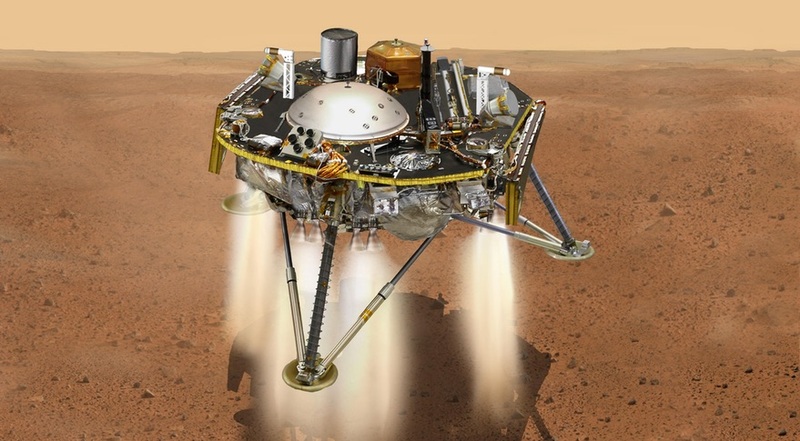 Once on the surface, InSight will deploy its two major instruments, a French-built seismometer and a German-built heat probe that will burrow several meters into the surface. Project scientists said that process, including scouting the best locations on the ground by the lander to place the instruments, will take several months. “InSight is kind of a laid-back, slow-motion mission,” said Bruce Banerdt, the principal investigator for InSight at JPL. “It’s going to take us probably two to three months, at least, to get our instruments down.” He estimated it would be “early next spring” before those principal instruments started returning data. With those instruments in place, scientists hope to learn more about the interior of Mars and compare it with other terrestrial planets, including the Earth. “The number one question we want to answer is what’s the structure and the energetics of the interior of Mars,” Banerdt said. That includes the size and density of the planet’s core, the thickness of the planet’s crust and the structure of the mantle.